What a sweet family! I feel very blessed that both of my children have had Mrs. Mullinax as a teacher! She is one of the best and has invested so much in the lives of my children! 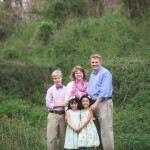 It was special to be able to return the favor by capturing her family! Here is sweet Olivia! Preciousness in a bowl!